London Irish have signed Samoa international lock Dan Leo for next season on a one-year deal. 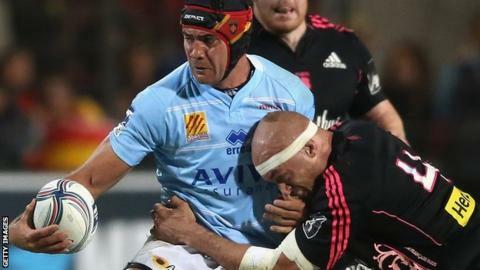 Leo joins from Top 14 side Perpignan, having previously played for London Wasps before moving to France. The 31-year-old made his first appearance in the Premiership in 2005, leaving for France in 2010. "Dan Leo is a seasoned campaigner and will be a huge asset to our squad next season," said Exiles director of rugby Brian Smith. "He knows what it takes to win big games and titles from his time at Wasps and has a wealth of Test match experience. "He's a big physical player comfortable at lock and across the back row. He adds further strength and depth to the pack and we're delighted to have him on board." Leo himself said he was excited to be returning to the Premiership, with the Exiles having the option to extend his deal further. "I'm excited to be moving back to England to join London Irish," he said. "I always enjoyed playing in the Premiership and I'm excited to go back to compete in that competition again. Irish are building nicely for the future it I'm looking forward to being part of it."